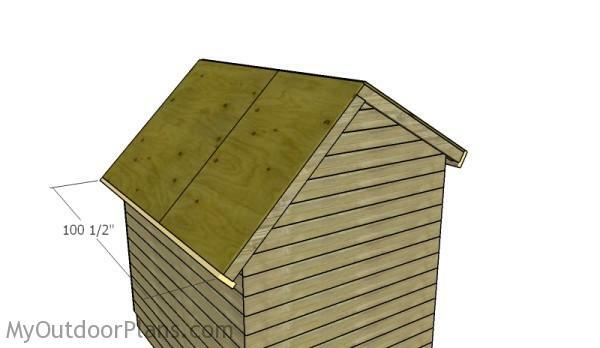 This step by step diy woodworking project is about 6×8 wood shed roof plans. 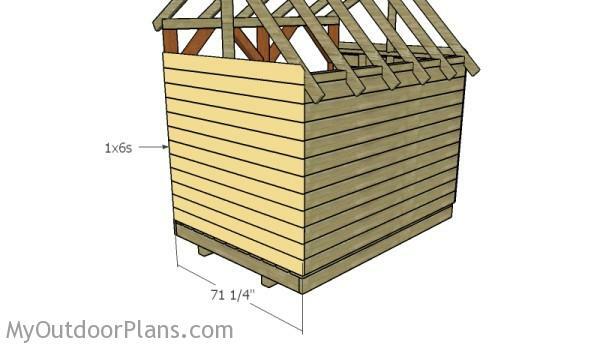 The project features instructions for building a saltbox roof for a 6×8 wood storage shed. This shed has a saltbox roof, so if you want a really unique look, this is the project to go after. 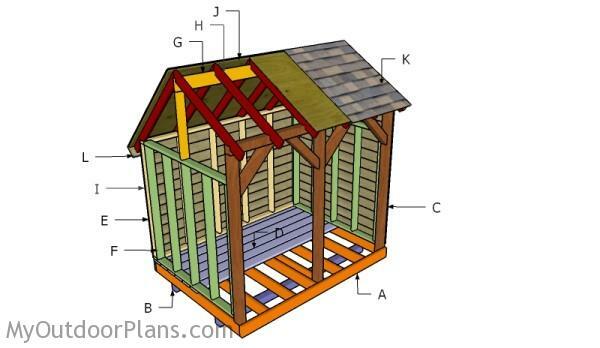 Check out PART 1 of the article to see how to frame the main structure of the shed. 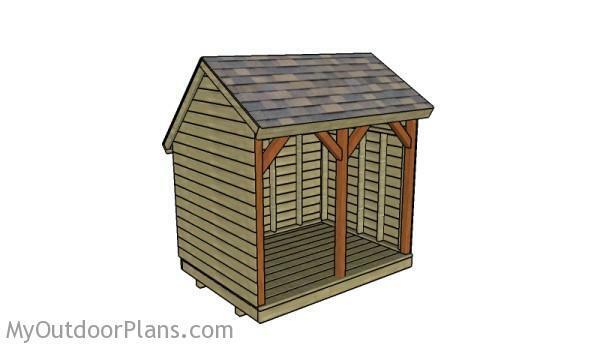 Don’t forget to take a look over the rest of firewood shed plans. 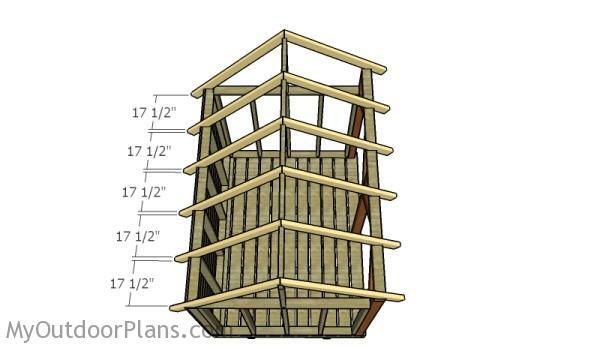 The first step of the project is to build the front rafters or the saltbox firewood shed. Cut one end of the 2×4 beams at 60 degrees. Afterwards, make the notches to the rafter, using the information from the diagram. 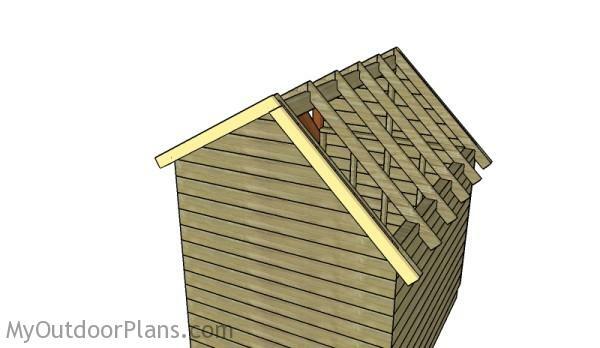 Continue by making the back rafters for the shed. 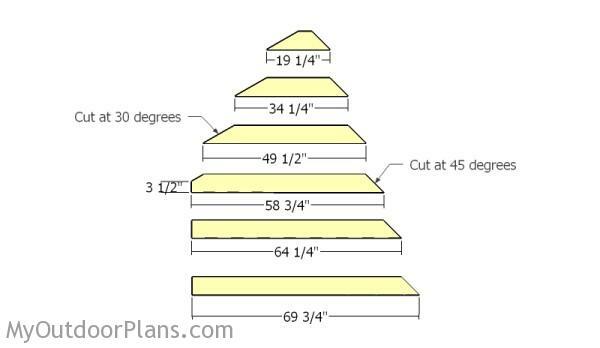 Cut one end of the 2×4 beams at 45 degrees/ Mark the cut lines on the beams and get the job done with a circular saw. 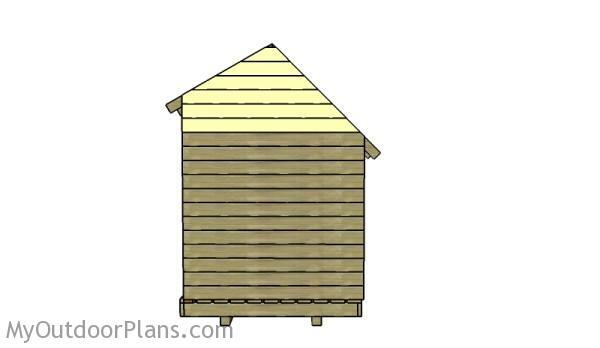 Next, attach the rafters to the top of the shed, as shown in the plans. Place the rafters equally-spaced for a professional result. Align everything with attention, drill pilot holes through the rafters and insert 3 1/2″ screws into the top plates. and into the top ridge. 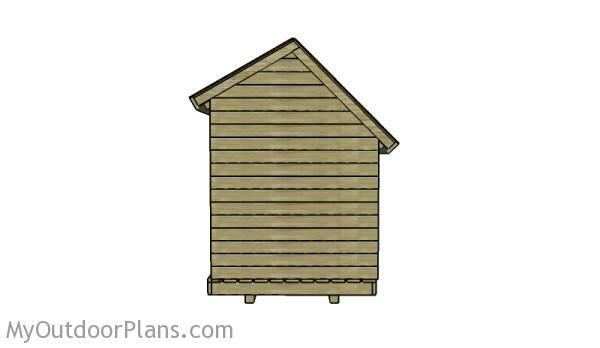 Attach the 1×6 slats to the sides of the shed, as shown in the plans. Leave no gaps between the slats and secure them to the framing with 1 5/8″ screws, after drilling pilot holes. Build the slats for the saltbox ends, as seen in the diagram. 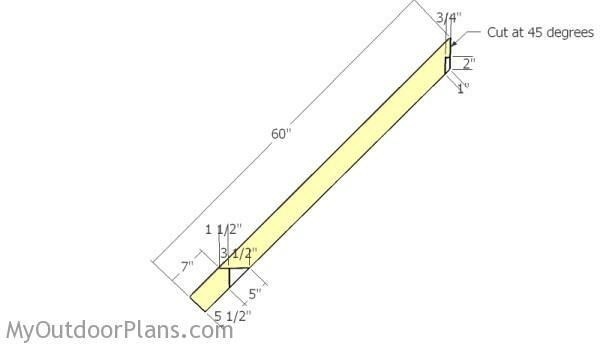 As you can notice, you need to make angle cuts to both sides of the slats. Attach the slats to the sides, as shown in the plans. Use 1 5/8″ screws to lock the slats to the framing. Build the side trims for the shed from 2×4 lumber. 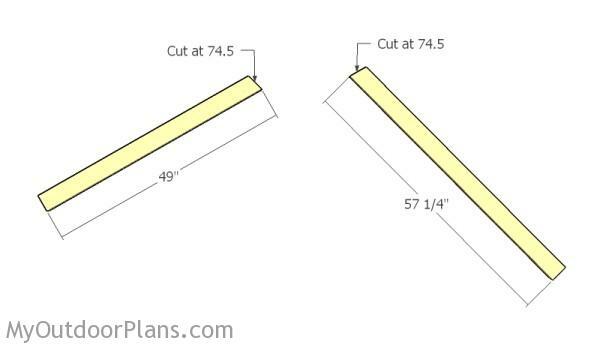 Make angle cuts at one end of the slats at 74.5 degrees. Attach the trims to the sides of the saltbox shed. 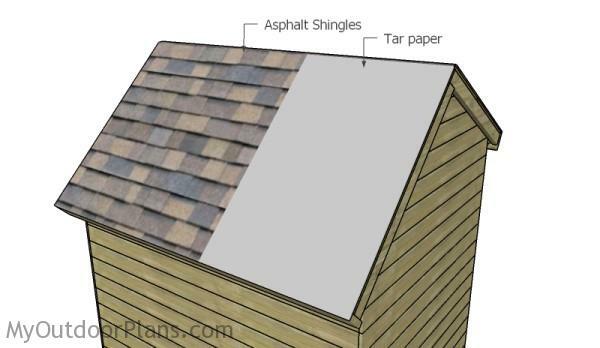 Use 1 5/8″ finishing nails to lock the trims to the sides of the shed. 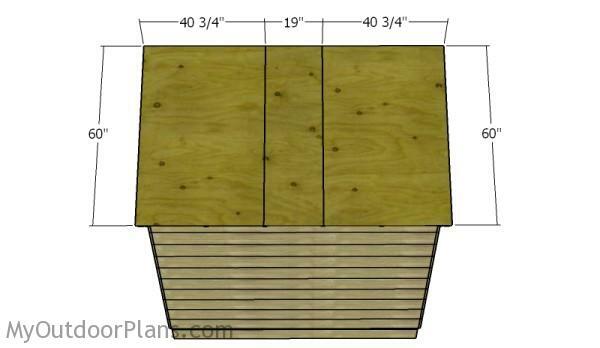 Attach 3/4″ plywood sheets to the front of the shed. Align the edges with attention and secure the sheets to the rafters using 1 5/8″ screws, every 8″. Attach the plywood sheets to the back of the shed. Align the sheets with attention and lock them into place with 1 5/8″ screws. Leave no gaps between the sheets. Afterwards, attach 2×6 trims to the end of the rafters. Use 2 1/2″ brad nails to lock the trims to the rafters, as shown in the diagram. The new firewood storage shed is ready to go, if you assembled everything tightly. Work with attention and double check all the joints, for a professional result. The saltbox shed seen from one side looks very rustic. Building one is a bold statement, as it doesn’t only have an utilitarian purpose. You can build several units, if you want to store even more firewood. Top Tip: Check out the rest of the project, to learn how to frame the shed. Take a look of PART 1. 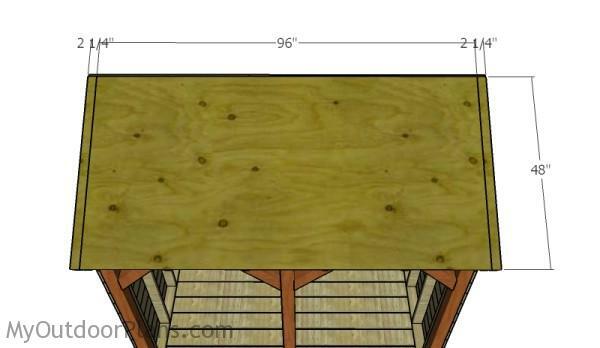 This woodworking project was about 6×8 firewood shed roof plans. If you want to see more outdoor plans, check out the rest of our step by step projects and follow the instructions to obtain a professional result. 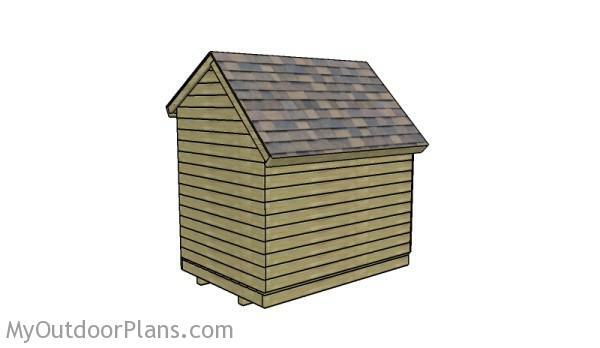 I actually am using your Saltbox shed and Saltbox roof plans. I was reviewing the rafter, front and rear, measurements. I noticed that there wasn’t a measurement for the front rafter notch cut like you show for the rear raft notch cut. Why is that? I was able to use some geometry to figure out that notch angle and calculate the length, but it sure would have been nice to have it noted. 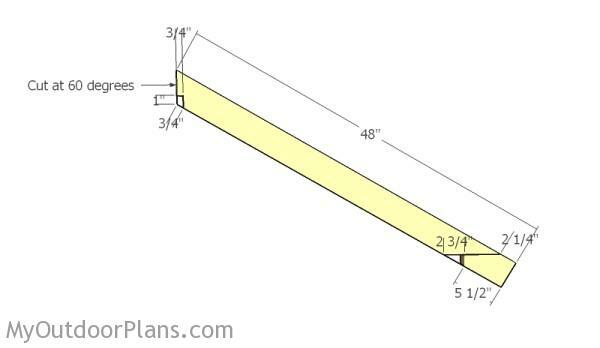 For this project, the large notch for the front rafters is 3″ wide. Hope that helps. 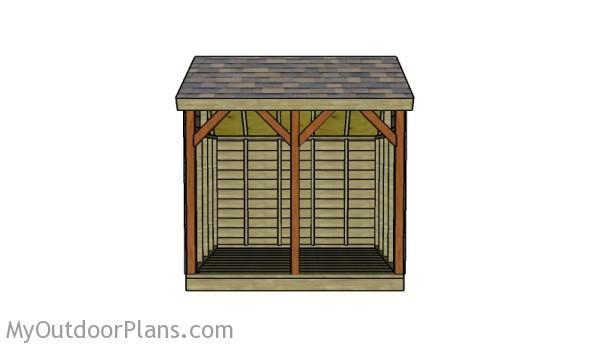 I’m planning to use these plans to build a shed on a flat grassy area that stays wet much of the year. Instead of using wood skids, I’d like rest the bottom frame on cinder blocks. I noticed that some of your smaller shed plans use this approach. Is there any reason this wouldn’t work for the 6×8? Thank you! That will work fine. Good luck with your project!